Restaurant owners: dirty menus are one of your customers’ biggest pet peeves. 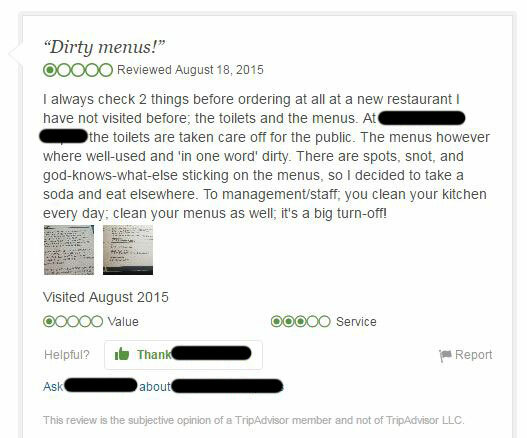 A basic Quora inquiry reveals complaint after complaint about dirty menus. A menu that is sticky, stained or has food remnants on it can be, at best, off-putting and, at worst, disgusting. You can easily lose customers over it. Even worse than losing customers? 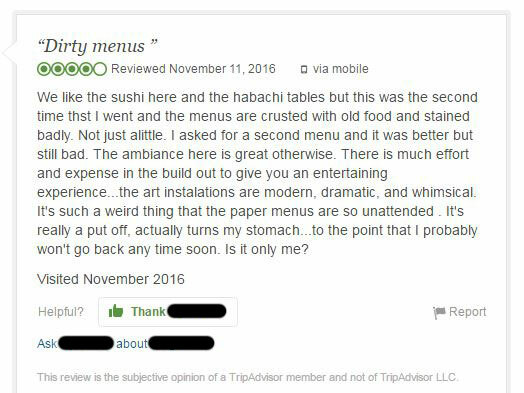 Customers posting about their negative experiences on a review site, like TripAdvisor or Yelp. Check out the images below – those are actual reviews on TripAdvisor. One customer’s bad impression then impacts countless potential customers. Their likelihood to want to visit your restaurant decreases. All of this can be avoided by simply keeping menus clean. Beyond the obvious ick factor of old food sticking to menus, there are other elements to consider. Even menus that look clean to the naked eye can harbor a multitude of germs. Think about it: everyone touches them. If you aren’t cleaning your menus with an antibacterial cleaning agent, your menu is bound to be unsanitary. Indeed, there was a 2013 report published by a team of researchers that suggests menus can serve as vehicles for pathogens such as salmonella and E. coli. If you aren’t regularly cleaning your menus, you are doing your restaurant – and your customers – a real disservice. Dirty menus are an often overlooked, but easy-to-solve problem. 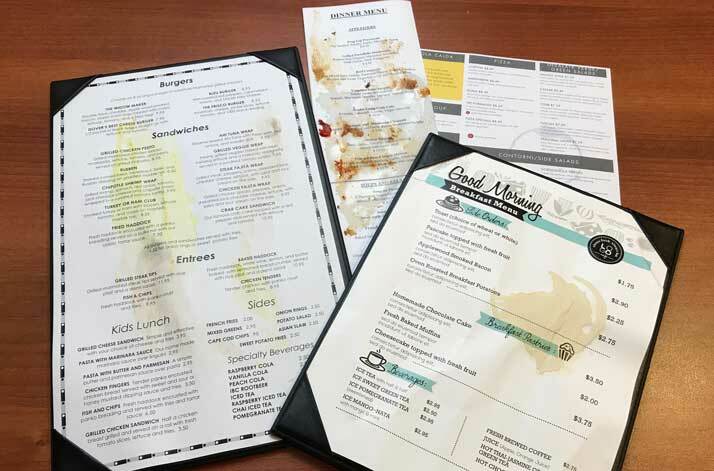 To ensure that you always have fresh, clean menus to present, you have two choices: constantly re-print paper menus or print once on a material that can be washed and sanitized. If you decide to avoid paper menus because of the cost associated with daily printing, then you probably don’t want to laminate either. Lamination can look cheap. It is also a time-consuming and expensive hassle that isn’t all that effective in the long run. For a permanent solution, consider synthetic waterproof paper. It is super durable and will outlast all other menu materials. It is tear-proof and easily endures heavy handling. You can even print your own menus if you’d like to. The waterproof material can be washed and wiped down to sanitize it. The synthetic material will not break down even after multiple cleanings. But it is important to point out that if you use a harsh chemical cleaner, the toner might start to flake off. This can also happen if menus are stacked while wet. Toner failure can be easily avoided by visiting your local print shop and UV coating your menus. Waterproof menu options are available in a variety of sizes, thicknesses and colors on our REVLAR waterproof material. Click here or on the button below to learn more about waterproof menus with our free guide!